Rather than carrying the extras as spares, how about making the rears dualies? Well, there's always Hipkin's Traction Device. One of my least favourite activities....chaining up a truck. Especially in the spring thaw when you get soaked with freezing mud Still a cool looking idea ! I thought you were supposed to taking the chains OFF, in the Spring Thaw? You'd think....but it's so greasy that you actually need them. I like the jacked-up look - really suits it. If you're going for that Master Box set, remember that lots of British light vehicles also used Brens and Boyes AT rifles. I'm just going to scratch somat up using existing 35th scale dun stocks. That's why I like the water cooled look, easy enough to cut up some tube and voila ! I do like those heavy guns tho, and was thinking of adding one. Finally started working on the guns. Not much yet, but I'll spice em up a little ! Thank you Sir ! 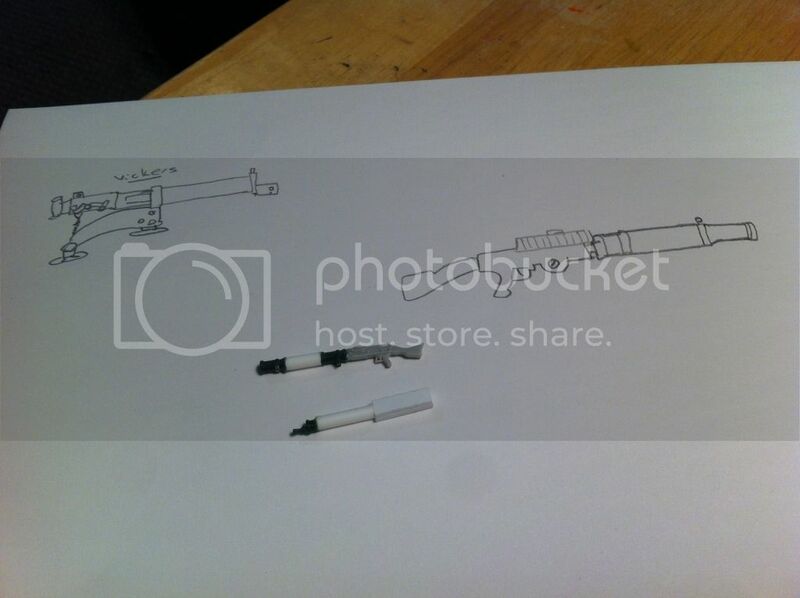 Not really happy with the Vickers, but once I add some details and the mount I'm sure it will be fine. Thanks Chris ! Actually looking forward to doing some more work on them tonite. Have to source out the ammunition drum and make some spares to hang in the car. Might redo the Vickers as well, found a pice that's a little beefier that might give it a better look.